Join our team! 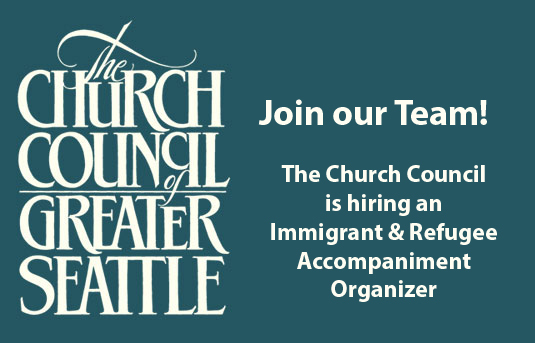 The Church Council is hiring for an Immigrant and Refugee Accompaniment Organizer. This position will deepen and broaden work linking immigrant and refugee communities with access to housing, services and advocacy opportunities, as part of faith and community-based organizing efforts. The person will be supervised by the Church Council of Greater Seattle Executive Director and work closely with the Church Council Senior Community Organizer. First review of applications will be on Friday, June 30, 2017. To apply, send a cover letter, completed application, resume, and list of three references (former and current employers with telephone numbers and addresses) to Ann Erickson or Ann Erickson, Office Manager, Church Council of Greater Seattle, PO Box 18467, Seattle WA 98118. The Church Council of Greater Seattle is committed to diversity in the workplace and promotes equal employment opportunities for all staff members and applicants. The Church Council does not discriminate on the basis of age, race, color, gender, disability, marital status, veteran status, sexual orientation, national origin or religion. For certain positions, religious affiliation may be a bona fide qualification for a position. Ability to work positively with diverse religious communities is a requirement of this position. Immigrants and people of color are encouraged to apply.